Ever since my girls were lucky enough to get 2 Pookibells i.e. 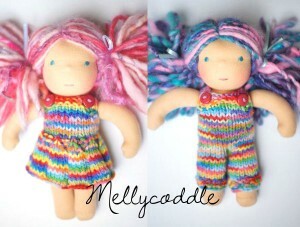 7″ dolls made by Pookidolls, I wanted to knit some clothes for them. Luckily Tomboy Knits decided to include the 7″ size in her pattern so I offered to test the pattern. Now to knit more clothes for them. The 7″ Waldorf Inspired dolls are made by Pookidolls (Pookidolls Facebook Page) and the pattern I tested is Tomboy Knits Overalls pattern. The yarn is “Double Rainbow” by DiscoBaby Knits on Mountain Meadow.